Footwear worn by men and women of the Roman Empire included sandals, which were basically thick leather soles held onto the foot with four or six flexible leather straps forming the 'uppers'. There was a more durable type of shoe favored for the Roman Legion. It was called the calceus, which name was derived from Calx, meaning 'heel'. 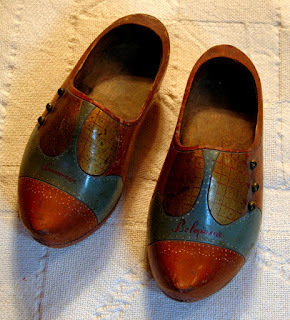 The calceus, variously calcei or caligae, consisted of a thick leather sole to which was attached a leather upper that covered the entire top of the foot and extended around the heel (hence the name), resembling modern shoes in basic structure. It was eventually discovered that shaping the sole from a thin slab of wood lasted even longer than the thick leather. Flexible leather continued to be used for the upper. Calcei were worn primarily outside, while sandals were favored for inside use. At some point, shoemakers began to make the sole out of wood to make the shoe even more durable and able to withstand the prolonged use demanded by the Legion's long campaigns. In the northern Germanic regions, the Roman calceus was adopted for use, but shoemakers there, as early as the 13th Century, took the design a step further by ridding the shoe of all the leather. 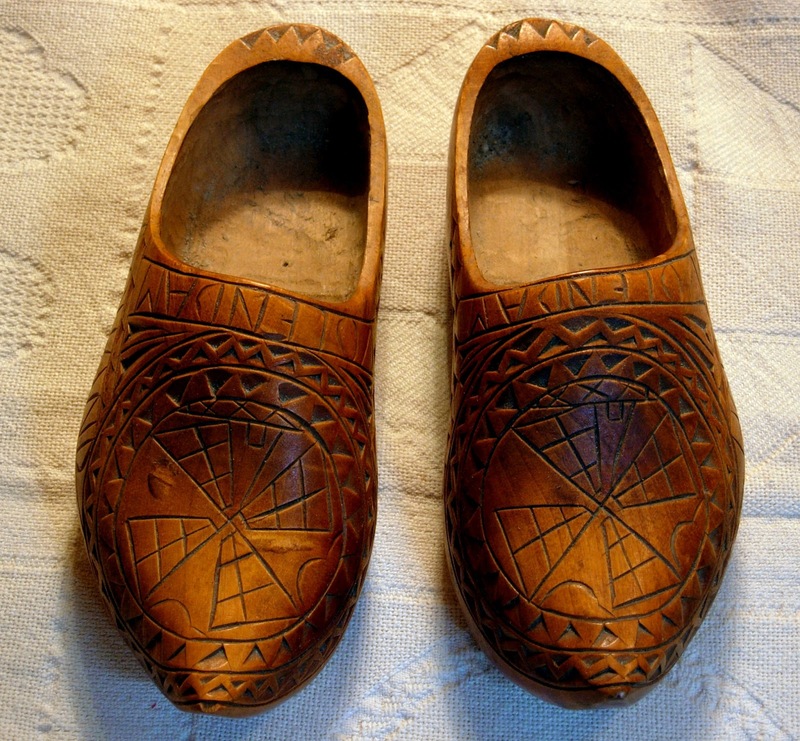 The entire shoe, sole and upper, began to be carved out of a single block of wood. With no leather to wear or rot away, the wooden shoe was ideal for use on any terrain, whether dry or wet, sloshy and muddy. 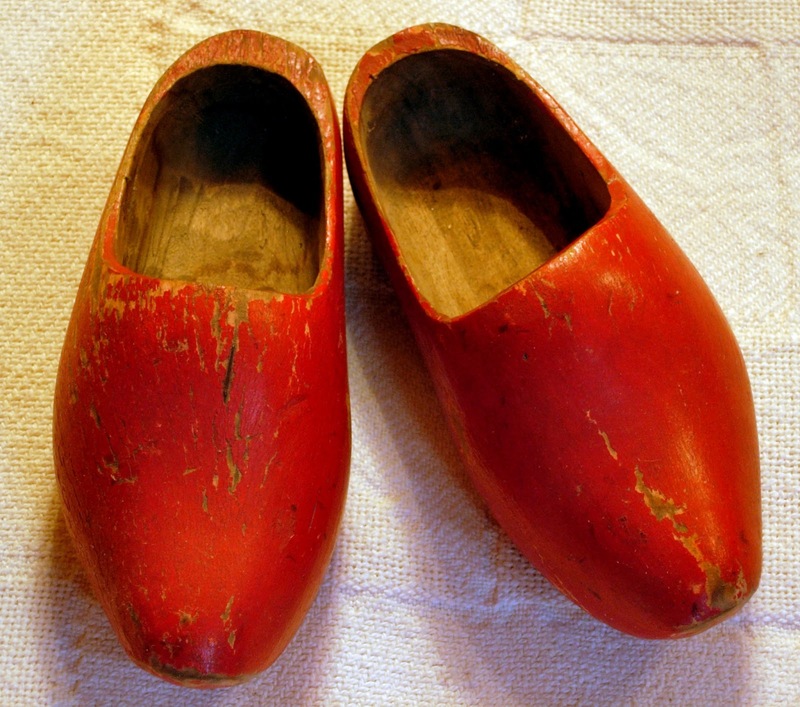 In the Germanic regions, the totally wooden shoe was differentiated from its wood and leather ancestor by the name of 'clog'. 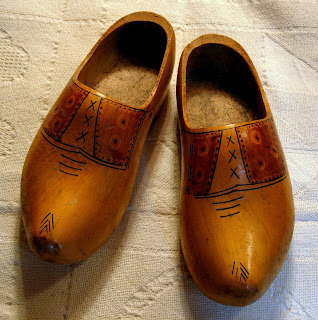 The word clog was derived from the word clogge, a 14th Century word meaning 'lump of wood'. 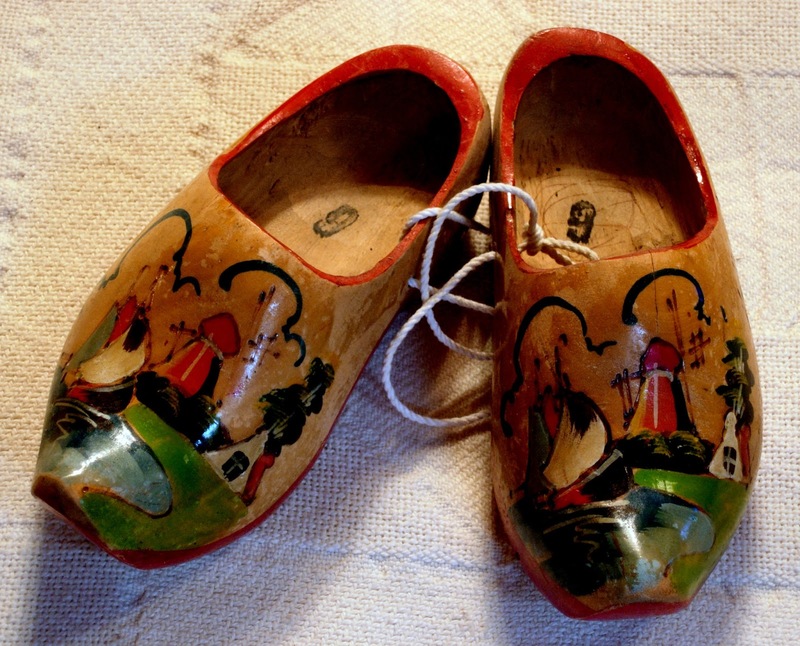 Clogs became very popular in the Netherlands, Denmark, Germany and France. Their use also spread to the Lower European and Balkan regions, where they were known variously as klumpe or klomp. Shoes with wooden soles developed and came into widespread use in Asia, but they tended to resemble the calcei, moreso than clogs. Wooden shoes went out of favor by the time of the Second World War, although they have remained in use to the present day by European farmers and other occupations which require working in muddy environments. 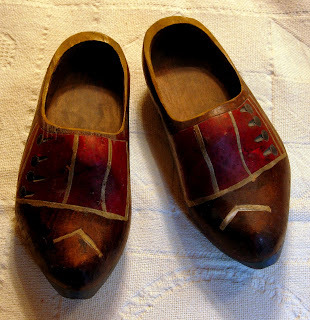 Today wooden shoes are generally called "Dutch Shoes" by many Americans, and modern generations are often amazed to find that they were used widely throughout countries such as France. Contributing to the general misconception that wooden clogs are "Dutch" shoes is the fact that most of these shoes that are found in the United States are stamped (or painted) with the phrase: Made in Holland. 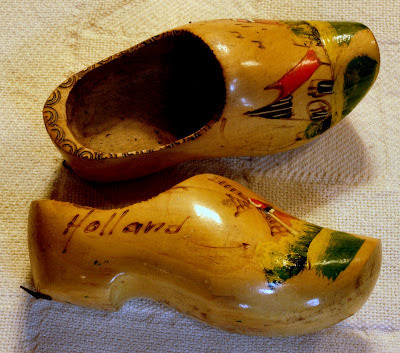 What most people do not know is that the phrase often refers to Holland, Michigan, where wooden shoes continue to be produced by companies such as the DeKlomp Wooden Shoe & Delft Factory. 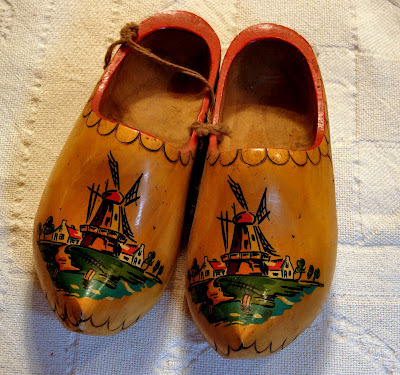 As can be seen in the examples shown here, designs include such traditional 'Dutch' scenes as windmills and sailing ships. Some shoes, such as three of the above examples, were painted to resemble 'real' shoes with buckles and flaps on the uppers. The one example shows a geometric design carved into the wood. 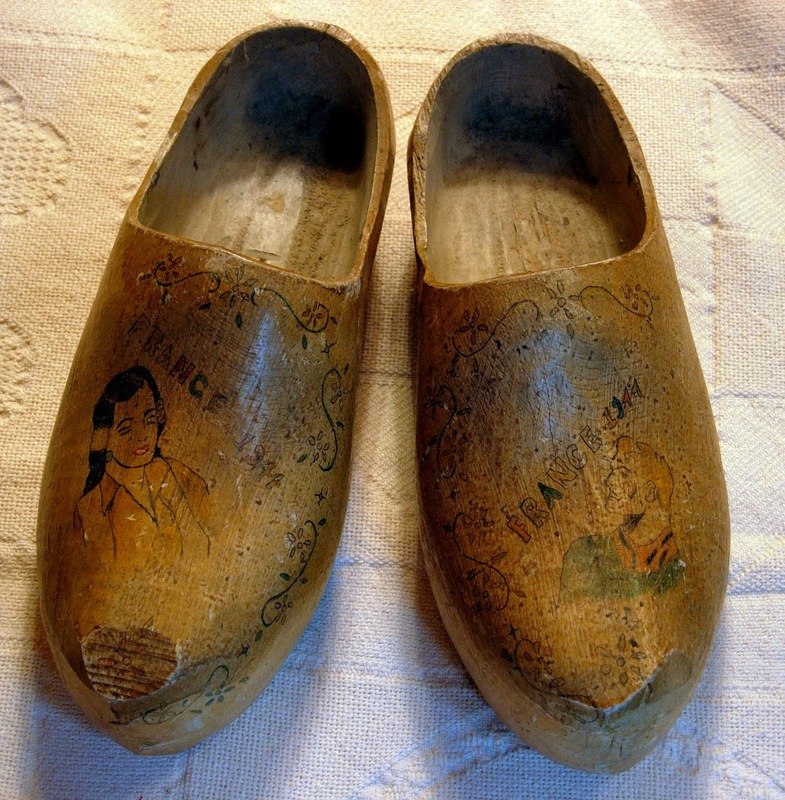 The fourth photo from the top shows 'buttons' attached to the wood and the words 'Souvenir' and 'Belgium' painted on the shoes. One pair is painted with a man's and woman's portraits and the words 'France 1944'. These are only a few examples of what are available as both antique and current designs. The spitball shooter was one of the essential toys for a young boy at the turn of the century (Twentieth, that is). If he didn't have a spitball shooter, he probably had a slingshot. The spitball shooter was neater than the slingshot though. Other essential toys for the young boy were marbles and a penknife. That was during a time when boys were boys and girls were girls, and ne'er the twain met. The spitball shooter was both an indoor and an outdoor toy. A young boy used the spitball shooter outside in contests with his friends, to see who could shoot a spitball the farthest. Inside he used it to shoot spitballs against the blackboard while the teacher had his or her back turned to the class. Boys today do not have spitball shooters to play with. All they have are video games and iPhone apps. ...Sad. Yes, it is very true ~ My mother made me eat gruel when I was a child! And I liked it. The word gruel conjures up images of nasty, maybe even maggot filled, gooey and wretched flavored food. It makes you think of horrid food that would only be eaten by the most depraved and starving of human beings ~ perhaps even scorned by wild dogs. But the word gruel was simply the name given to oatmeal, or whole oats, boiled in either water or milk. It tended to be more wet than solid, and was very similar in taste to a thicker version that was called porridge. Gruel was eaten as early as the Classical Period of the Greek and Roman Empires, where it was the staple of most meals. It was simple to prepare and bland enough to be liked by most people. The common people of the Classical, and on through the later Medieval and Renaissance periods, ate gruel during their meals much like later generations ate potatoes or rice. Likewise, in the Americas, a type of gruel was prepared from ground maize or corn into a food called atole, into which was also added chilis. The atole is normally made into a drink, sometimes flavored with chocolate; but it also was the basis, being thickened and heated, of the foodstuff that would develop into the now-common tortillas. Charles Dickens, through the images evoked in his book, Oliver Twist, contributed the most to giving gruel the bad name it carries today. The stinginess of the owner of the workhouse in which the young Oliver spent his miserable early years was illustrated by the small quantity of oatmeal and great amount of water that made up the gruel upon which the orphans had to subsist. But gruel can be actually quite enjoyable. When I was a child, my mother used to make me a dish of warm Maypo, over which was sprinkled two teaspoons of sugar and then doused with milk. I still eat it from time to time, because I have always liked the subtle maple flavoring. And even if you don't like maple flavoring, you can get plain oatmeal in the form of Quaker or Mother's Oats. Gruel is even packaged, single serving size, with dehydrated bits of fruit (peaches, blueberries, bananas or strawberries) under the name of "Instant" Oatmeal. Nowhere on the box will you find the word gruel, but there's no denying it ~ it's gruel. This type of hanging scales is sometimes referred to as a Roman Balance because scales of this type were first used during the time of the Roman Empire. According to Jaime Morrison in the website, thenonist.com: "The Romans brought these scales to Britain around 55 B.C.E., and the English word 'steelyard' by which they are referred today is thought to be a mistranslation of the German 'Stael-hof', which was itself the name of the base of the Hanseatic merchants of the Middle Ages, who used the Roman balance extensively in their businesses." Farmers would often use these scales to weigh pieces of meat, such as from a butchered pig, skewering the dangling hooks into the piece of meat, then hooking the top hook over a nail in a beam, or over a branch of a tree, so that the scales with its dangling weight could hang freely. Then the large bulbous counterweight would be moved outward along the arm until the small cross would line up with the arms of the top hook. This iron scales dates from 1846. That date is known because when scales like these were made, a coin from the year was usually attached to the end of the arm. The coin attached to the arm of this scales is dated 1846. The date on the coin can be seen in the photograph. "If ... I'll eat my hat" is a phrase that is often spoken by someone who is incredulous or skeptical, and does not believe that something in question is true or will proceed as suggested. In other words, if I say something like: "If he succeeds in doing that... I'll eat my hat", the implication is that I very much doubt that 'he' will be able to do 'it'. Moreso than just being skeptical about it, in making this type of statement I am, in a sense, making a wager that 'he' will fail. I am betting that if 'he' actually does succeed, then I am willing to destroy something of value to myself. There are numerous proposals in regard to where the phrase originated, and any of them might be correct. I personally have always preferred the one that I am about to offer in this post. of sugar was a common way for either raw or refined sugar to be shaped and packaged before being wrapped in paper for sale and storage. 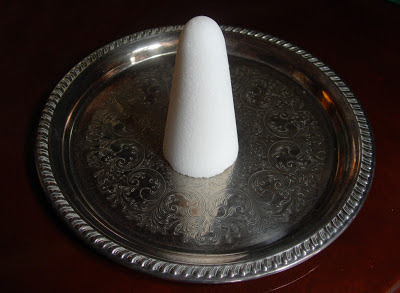 The homeowner would unwrap a cone or hat when needed, and using a small wooden, round-headed hammer (called, appropriately enough, a zuckerhammer, or 'sugar hammer'), the cone would be smashed into lumps and smaller grains. The larger lumps might be set aside for use in cups of tea (such as in: "Do you want one lump or two?"). Sugar was an expensive commodity during the Colonial period ~ or as a Colonial housewife might say: it was very dear. Despite its costliness, it was quite edible. That is why it was a thing that might be put up for wager. If the speaker of the phrase won the bet (and the thing being wagered against failed), then the extravagance of the sugar would not be wasted and lost. The speaker's integrity would remain intact. On the other hand, if the speaker of the phrase lost the bet (meaning the thing being wagered against actually succeeded), then the speaker would be obliged to consume his costly, though replaceable, article. The greater consequence being the embarrassment experienced by the one who had to eat his hat. The phrase, as it passed through time and away from the original German influence, came to be understood to be that the speaker of it was vowing to eat a piece of apparel ~ a cloth, leather or felt headgear. Although perhaps not originally intended, this later interpretation made the sense of the wager all the more sincere. The idea of someone having to actually chew on a piece of clothing meant that the speaker was very confident that the other person would fail. I'm sure that everyone reading this post is familiar with the spud and the purpose for which it was used. The spud was an essential tool used by woodsmen. It was used to separate the bark from a tree. After a tree would be felled, and the branches cut from the trunk, all would be cut into segments. Each segment, in turn, would be secured in some way, such as by hammering one leg of a "U" shaped 'log-dog' into the log and the other into a stationary 'log stand'. The woodsman would hold the metal 'neck' of the spud in one hand and the wooden 'handle' in the other. The fore-edge of the flattened head of the spud would be rammed against the bark of each segment, parallel to the length of the segment, and with the bevel edge facing away from the worker, in order to break the surface of the bark. When a break or crack in the outer bark would be effected, the flattened head of the spud would be turned around so that the bevel edge would be facing the worker; the spud would be forced farther into the crack and then jostled back and forth to increase the space between the bark and the sapwood. The tool would be moved in a line lengthwise along the log segment, cracking the outer bark, and continuing to loosen it from the log until the entire length of the log would be accomplished. There are two layers of bark on a tree: the outer bark and the phloem or inner bark. Sometimes the inner bark was needed to be preserved for use. The trick was to separate the outer layer without damaging the inner layer in the process. The woodsman, through practice, would come to know how much pressure to apply so that he would not penetrate too far with each jab of the spud. The inner layer of bark would be carefully removed from the log segment and utilized to make cordage (which was used for basket making, chair matting and so forth). This more delicate work was accomplished by chisels rather than the spud. The spud shown above in the photos was fabricated by a blacksmith in iron in the process known as wrought iron. Despite being between 100 and 150 years old, the iron does not display any rust. The pitted look of the surface is the result of the iron having been hammered into shape by the blacksmith. Clock Reels were used by nearly every family in early Bedford County, because they were necessary to measure the yarn spun by the housewife ~ and that would have been the case for just about every family except a few. The spinning of yarn, either from wool or flax, was something that housewives (with the help of their children) had to do if they needed things such as new clothes or any other cloth items. Yarn simply was not easily available to be bought; you had to make your own if you wanted it. There is a mistaken idea that the early settlers wove their own cloth from the yarn they had spun. Very few actual settlers had the room for a loom, nor did they have the time to spend weaving, which was time and energy exhausting. In actuality, the homesteading families spun their own yarn, which was then taken to a professional weaver to have the cloth woven. But before the yarn was taken to the weaver, it needed to be measured. That is where the clock reel came in. As the yarn was spun, it would be collected on the spinning wheel's bobbin. When that became full, the job of measuring the yarn would be given to one or two of the family's children. An end of the newly spun yarn would be loosely tied to an arm of the clock reel. Then it would be wound around the outside of the other arms and as the bobbin was held stationary, the arms of the clock reel was turned around, thereby winding the yarn around and around. The reason this piece of equipment is called a clock reel is because it contains a group of gears, similar to a clock, which allow it to measure the number of turns made by the arms. The arm assembly was attached to a gear, whose teeth were interconnected to another gear. That other gear had one tooth that was a slight bit longer than the rest. The purpose of the one longer tooth was to push against a slender piece of wood, called a 'weasel'. The weasel would be bent out of line and as the longer tooth pushed past it, the weasel would snap back in place, at the same time smacking against a stationary block of wood attached to the inside wall of the clock reel, making a 'click' sound. For that reason, this reel was also sometimes called a click reel. From the point that the weasel snapped against the wall to make a 'click' until the next time that it 'clicked', a certain length of yarn would be wound around the clock reel's arms. The clock reel shown in the photo above has an 'around the arms' circumference of 90 inches. From one 'click' to another it takes 120 turns. The 120 turns measure 10,800 inches / 900 feet / 300 yards. Different sources give the length of a skein anywhere from 500 to 1200 feet (it depends on the thickness and weight of the yarn). The homesteading housewife would find out from the local weaver how many feet of yarn he required in a skein, and measure it accordingly. Clock reels, as noted above, were sometimes called click reels because of the clicking sound they made. They also were sometimes called cleck reels, for the same reason. The name given to this piece of equipment, by people who aren't aware of their 'historic' or 'traditional' names, is simply yarn winder. They are sometimes, mistakenly, called swifts or niddy noddys, but those are other pieces of equipment which look quite different from the clock reel. It is also claimed by some that the children's nursery rhyme Hickory Dickory Dock referred to the clock reel. The 'clock' striking one was the clock reel's weasel snapping back into place. The MotherBedford.com website, as some of you who have already visited it might be aware, is devoted to the history of the south-central region of Pennsylvania that was created as Bedford County in 1771. The time periods covered in the website are primarily the Colonial (from the late-1600s to the 1760s) and the American Revolutionary War (from the 1760s to the 1780s). For the website I have written a number of (sometimes lengthy) articles on a variety of topics relating to the American Revolutionary War and how it affected the residents of this frontier region. Articles also deal with everyday life during the Colonial and the American Revolutionary War periods. For this blog, I plan to present a number of smaller articles about things that relate to the time periods that the website encompasses, but which might not fit into the website itself.